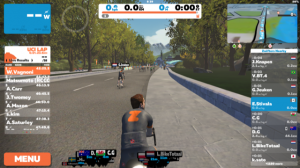 A second attempt at falling in lust with Zwift… Nope that failed too. Not so much as a head turn or slight interest let alone lust, passion or love! I seem to have managed to get a bit further with it in that not only is my trainer connected, but I managed to find something claiming to be a workout, but having started it I had no idea what was coming up or what phase I was in. The turbo appeared to be relatively free wheeling and this dull as dishwater experience continued for ten minutes. There simply must be more to this Zwift thing than I am currently ‘getting’. After all it has developed a cult following of a real cross section of athletes in very short order. They seem engaged, some of my friends who’s views I respect use it and regularly post on their results on Strava. So now I am doubly frustrated; I wasted ten minutes on my training time! And secondly I really think I am missing out.